Okay maybe not prayers. More of a wish. 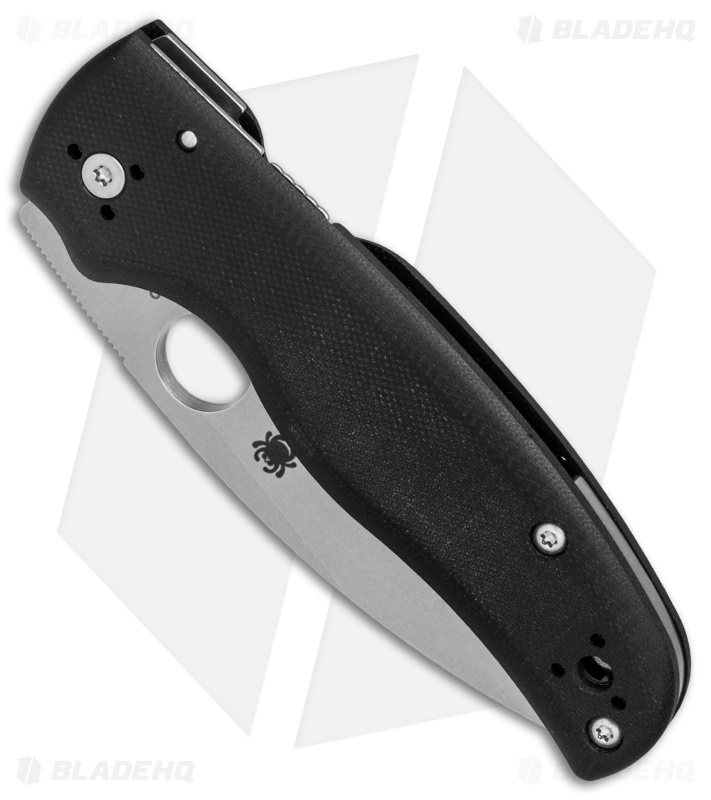 For years I wished Spyderco would produce a compression lock Native. Well a bit like wishing in the movies where you ask for one thing and you get something ALMOST like what you wanted but with a kicker, we got the Shaman. It’s an absolute beast of a knife. Thick blade stock, comfortable handles, buttery smooth drop shut compression lock AND made in Colorado! It’s nearly perfect. Except the size is gigantic for me. I still want a compression lock Native but spyderco really did an excellent job on this Shaman. This is a knife you feel great about using. It feels great in the hand, isn't flashy, and gets the job done. Pictures don't do it justice, you really have to put this thing in your hand. Mine came with a scratchy action. It was easy to disassemble, clean, lube, and reassemble, and the action was perfect after that. There is a noticeable ridge between the back spacer and the scales, like the back spacer was ground down too much, which is slightly annoying (hence -1 star). Large, Tough and well built. You will not regret buying this knife! Highly recommended if you need a tool that can work hard. The shaman has put a spell on me! I was never a fan of Spyderco knives. With the camel hump on most Spyderco knives they were too unusual and not for me. After this knife came out I saw the great reviews it received and decided to look into it a little further. After a few months I finally decided to pick one up. I can say now, without a doubt, this is my all time favorite knife of all the knives I own. I'm 6' 5" and have large hands. This fits in my hands perfectly and the contoured G10 handles feel amazing. This thing gets the job done and is a tank of a knife and looks gorgeous while doing it. The Spyderco Shaman brought me to love Spyderco. This is a fantastic knife, razor sharp out of the box, excellent ergos, very nice action. It took a week or two to get the action buttery smooth like it is now, but now that its broken in, its perfect. This is a beast of a tool, lock up is perfect, and i feel confident saying that this is a really hard use knife. I carry it everyday and i use it for everything. I love this knife I carry it every day and use it on everything. Fit and finish is awesome I highly recommend this knife to anyone who wants a dependable work horse. I'm a huge Spyderco fan and a serious collector, this has to be the best knife on the market today. It's easy to carry but an absolute tank at the same time. I've been a Spyderco collector for 20 years now, and out of the 60+ that I have, the Shaman is probably my favorite and most used knife. The contoured g10 scales offer great comfort and ergonomics. The compression lock is strong and easy to manipulate. The full flat grind makes for a great slicer, and a robust cutter. And this thing is a monster, but yet can do more delicate tasks because of the great control the design provides. I love all my Spydercos, but this one, this one is my favorite user. I'm just saying, as a guy with xxl hands, this is a PM2 killer. Assuming you have Large to XXL hands aswell, this review applies to you, but smaller hands? I'd hesitate on this purchase if that's the case. 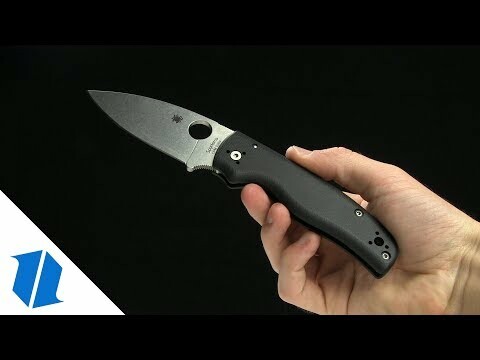 But, compared to the Paramilitary 2 from Spyderco you get: Better ergos, snappier action, sleeker design, more blade, a full choil, and thicker blade stock!? If you can get over the tiny weight increase then you'll never go back to your PM2 ( or comparable blade ). Sorry Manix 2 people, but this blows your Manix out of the water. This thing is just perfection. Only complaint is we need different colors besides Black and Silver!! 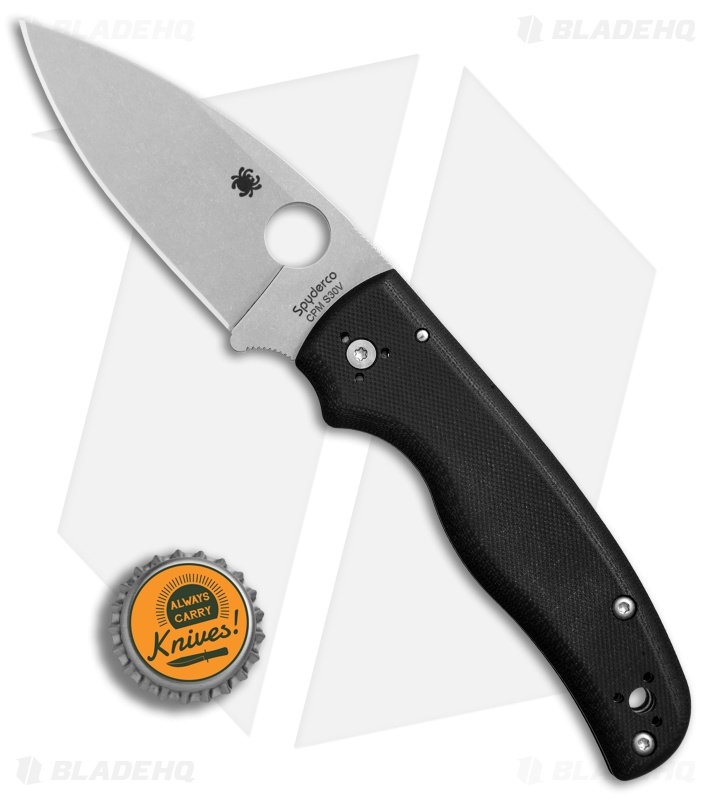 Come on spyderco, this thing should be in your top 3 flagships 100%! Best knife for the money HANDS DOWN. And I'm not even a huge spyderco guy but this knife makes me fall in love with the brand all over again. I dare you to find any respected knife reviewer that doesn't dig this knife. Just underrated and unbeatable in my opinion. Great work Mr. Glesser and everyone over at Spyderco. Job well done. Such a beast. Can get any job done. Such a comfy handle. Ridiculous action and lockup. Scary sharp. Forward finger choil interferes slightly with the compression lock tab. You get used to it though. This is a Beefy Knife! It was a little tight and gritty to start with but after a little break in period, this is a solid knife. I love it. A great and powerhouse of a knife for its beefy size. Had mine for a month. Carry it everyday. The lock engages harder and louder that typical compression lock. Sounds so secure. Lock bar has a lot of tension so expect it to be a little stiff. But when lock is disengaged properly it swings shut and sounds nice with the D tent. Also the tip on mine is very pointy and sharp for its dimension. Great piercing knife. It does feel heavy when you carry it but in use it feels like a PM2 to me. After a little bit of stropping the factory, edge became razor sharp. First off, this knife is fantastic. It's like a blend of all my favorite things from spyderco. Excellent steel, the legendary compression lock, excellent F&F(a few nitpicks, but more on that later), and amazing ergonomics. Build quality: The shaman is a large and beefy offering from spyderco. It wont even bat an eye at the harder task you ask of it. The blade stock is plenty thick, but with the high saber grind, it's quite an aggressive slicer. The G10 handles are contoured very nicely, with been edges all around. It seems that the backspacer is not flush, but it seems that was done on purpose for whatever reason. Everyone I know who owns a shaman has the slightly sunken backspacer. Not enough in my opinion to knock off a star. The knife sits on bronze washers and is fairly smooth. It is rather stiff out of the box, but it loosens up nicely after a little time spent opening and closing. No lock stick to report on my specimen. Very solid lockup with no horizontal or lateral movement and the knife uses a floating stop pin, so as to not disturb the action. Looks: The Shaman is a very well balanced and refined looking knife. Spyderco seems to have pulled off a hard use knife that looks good, and I like it. The stonewashed blade and hardware are gorgeous and something I wish Spyderco did a lot more often. Despite the blade being so thick, it tapers to a very sharp tip with very clean lines. Ergonomics and carry: The Shaman has an excellent and very comfortable contoured G10 handle, with very adequate jimping and a comfortable, albeit slightly intrusive choil. The choil happens to protrude just so over the compression lock bar, an makes for some awkward finger positioning for lock actuated closing. The knife feels great in a variety of grips and doesn't fatigue my hands like some other knife handles do, even with extended use. 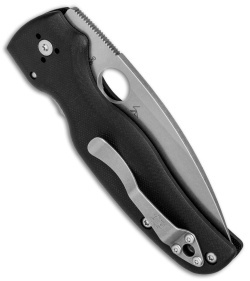 The knife is equipped with a 4 way stonewashed pocket clip so carry options are plentiful. The knife does carry fairly high which can be positive and/or negative depending on personal preference. Final thoughts: The Spyderco shaman is an excellent example of Spydercos commitment to bringing excellent cutting tools that will perform and excel in whatever tasks you ask of it. It's a beautiful blend of the Native5's shape and ergonomics, the Manix 2's stoutness, and Paramilitary 2's lock and smoothness. I would highly recommend this knife. -Jake P., 13 year knife user and collector. You would think with how large the knife is it would not be the best in pocket, but that is far from the truth, carrying the shamen is joy and quite a gem! I just got it yesterday so I haven't had a lot of time to use it but so far I like it a lot. It's a bit beefier than the Manix 2 while maintaining similar dimensions overall. The greater blade thickness is where it stands out. On paper it probably seems minimal but in my opinion it does inspire a bit more confidence in heavier duty tasks. The blade and pocket clip are actually stonewashed not satin(as described) which to me is a plus. The g10 scales have nested but sturdy steel liners. They're sculpted nicely for ergonomics and fairly grippy. They're not as aggressive as the g10 on some other models but are by no means slick. If I had any nitpicks it would be that the g10 scales are a little "sharp" on the inside edges. Also, on the tail end the scales and the back spacer do not sit flush. Not sure if this is intended or maybe a QC fault. I suppose I could do some sanding and make it right but it kind of stings to have to do that for $150. I don't know if it's worth returning or trying to get ahold of Spyderco over but I'll consider it. Overall, the design is solid and it strikes me a great work knife rather than a show piece. I'd imagine that this will be a big hit for Spyderco fans. I look forward to an exotic sprint run in the future!